Konicom's remote data backup service provides clients with data security using the most up-to-date and tested offsite backup technology available. Your documents, images and email are protected from intrusion by any outsider, including Konicom staff and technicians. You alone have access to your secure data backup files. Our Sacramento offsite backup data center provides you with the ultimate peace of mind regarding the safety and security of your data. If your computers crash or your physical site is damaged, your stored and updated information remains accessible and available to you. Secure remote data backup means your important records are safe, no matter where you are located. 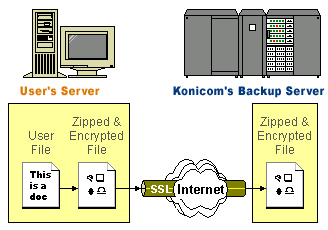 Information on your computer is transmitted over the Internet to Konicom’s secure remote backup servers. When your data files travel over the Internet they are transported in a 128-bit Secure Socket Layer (SSL) channel. This layer is impenetrable and completely secure from intrusion by hackers and other intruders. When you send data to our Sacramento remote backup center, the first step begins at your end. Your files are zipped and then encrypted with your defined encryption key before they are sent over the Internet for offsite backup. The encryption key resides only on your computer and only you and your designated staff knows your unique key. System administrators, Konicom IT professionals and potential intruders will not be able to decrypt your key and look at your secure data without your permission. How secure can encryption be? The algorithm that supports our encryption is 128-bit Twofish that was chosen by the National Institute of Standards and Technology (NIST) as one of five Advanced Encryption Standard (AES) finalists. This federal technology agency is engaged in cutting-edge research and assessment of security software. To date, the Twofish algorithm has proven too complex and no attacks against it have been reported. We are proud to offer this level of protection on our Sacramento remote backup system. A 128-bit key size has 2128 or around 3.4 x 1038 possible combinations. If you have the world’s best super computer such as an ASCI White, SP Power3 375 MHz with 8192 processors totaling a capability of 12.3 teraflops (trillions of operations/second), it would take 8.77 x 1017 years to test all decryption combinations. Even when computers are a million times faster than they are now (about 20 years from now if they double in speed every year), it would then still take about 6 thousand trillion years, which is about a million times longer than the Earth has been around1. 128-bit encryption is extremely secure. You can be assured that your data stored on our server is totally secured. You can also restrict access to your backup files by defining a set of "allowed" IP addresses. If someone tries to access your data from an unrecognized IP address, their access will be denied. This additional security ensures backup files are not open to all locations, even if the username and password are known. Loss of data can be financially devastating for small businesses. It only makes sense to protect and backup data on a secure location so that your business remains uninterrupted no matter what happens at your brick and mortar site. Remote data backup is an area of expertise for Konicom. At our Sacramento remote data backup center, our IT professionals employ remote backup software with the best security and are dedicated to providing a secure environment for your data. Konicom invites your Information Technology professionals to call us with specific technical questions about remote data backup. Call Bryan Wu at (916) 441-7373 extension 13 or by Email.